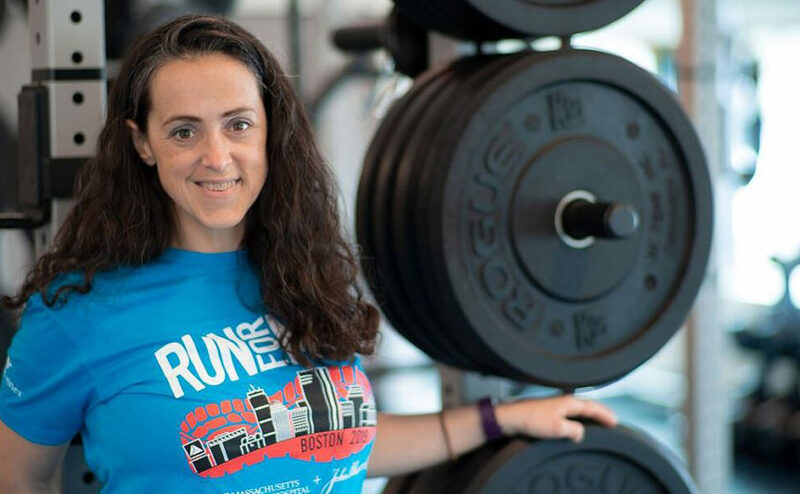 Army Major Vanessa Stolzoff has stepped up her training to prepare for the 2019 Boston Marathon®, which will be her first full marathon. Army Major Vanessa Stolzoff is upping her workouts to run her first-ever Boston Marathon on April 15, 2019. She’ll join others on the Home Base team raising money for this Red Sox Foundation and Massachusetts General Hospital program that helps veterans, service members and their families heal from the invisible wounds of war. Nearly 3 million men and women have served in the military since 9/11. An estimated one in three will return home with such invisible wounds as post-traumatic stress or a brain injury. Additionally, others experience depression, anxiety or family relationship challenges. Regardless of ability to pay, Home Base offers clinical care, support and wellness programs. “I’m running to raise money so fellow service members, veterans and their family members can receive the care and support they need at Home Base,” she says. MAJ Stolzoff grew up in Georgia. Her father, whose dream of serving in the military ended with a bad accident, passed along to her and her brother his love for military history. Family trips often included visits to Civil War and Revolutionary War battlefields. She successfully set her sights on attending one of the U.S. Service academies, graduating from West Point in 2003. “I have very much enjoyed the structure, camaraderie, team spirit and the pride of serving others,” she says. An engineering officer, she served on active duty for close to 11 years, including deployments to Iraq as an electrical engineer and to Afghanistan as a company commander. She started her civilian career in the fall of 2013 and since then, continues to serve in the Army Reserves. She works full time for Amtrak in Boston. MAJ Stolzoff participates in Home Base’s Warrior Health and Fitness Program. It is designed to improve physical health and well-being through supervised physical exercise and education about healthy eating, living, sleep hygiene and stress management. “I missed that day-to-day camaraderie,” she says. “Now I’m part of something again.” Hiking, yoga and weightlifting are other activities that have helped her stay centered. MAJ Stolzoff points to the importance of Home Base for families too, who may struggle to deal with changes in their loved one returning from deployment. She created a video to show the families of the men and women she commanded what the days were like and to thank them for their constant support. It’s posted on her Boston Marathon crowdrise website. Her biggest supporter is her father, who will be there on marathon day to cheer her on. MAJ Stolzoff competed in numerous half marathons — 13.1 miles — but increased her training “immensely” to prepare for her first full marathon. “It’s been great to build on a foundation and really push myself to accomplish something,” she says. Though she pushes herself, she says she has also learned to listen to her body and be kinder to herself. Her biggest supporter is her father, who will be there on marathon day to cheer her on. Immensely proud of his daughter’s accomplishments in the military, he too serves the military community. He volunteers at the USO and Toys for Tots, and mentors veterans through American Corporate Partners – for which he was recognized with a community service award from NBC station in Atlanta, GA, in 2015. Self motivation is essential, but MAJ Stolzoff says the camaraderie among her Home Base Warrior Health and Fitness peers gets her going too. There’s even been some good-natured rivalry between Navy and Army members involved with Warrior Health and Fitness. “I’m running this race for them and all my fellow service members, family members and veterans,” she says. Please consider supporting Vanessa Stolzoff and the other dedicated runners raising funds for Home Base.